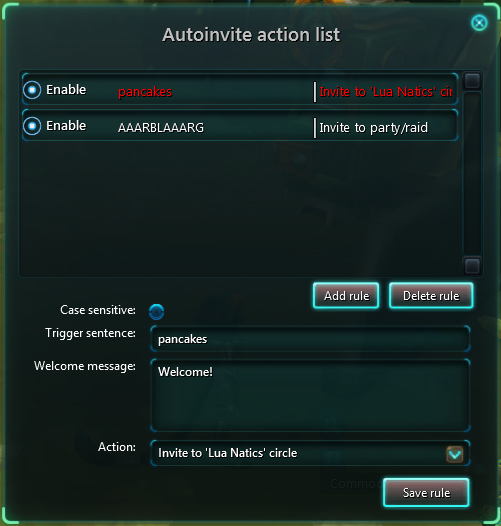 This addon can automate invitations of people to your guild/circle/party/raid by defining triggerwords. When people whisper you the triggerword, the associated action will be performed. For anyone wanting to invite new members to their circle guild without having to be active ingame all the time. Also for people organising big raids and rather want people to check in themselves instead of inviting everyone manually. Welcome message: What message should you whisper back? Leave empty for no message. Action: Dropdown list of possible actions to perform. When you are done, press "Save rule" and you are all set! With the "enable" checkbox you can enable/disable rules on the fly. Would it be possible to implement an auto-promote invited players to raid assistant option?